There is roughly 55m SF of office spec and construction nationally at a time when the vacancy rate has dipped to 15.2 percent. Seems like a lot until you consider past recessions. Robert Bach, Director of Research – Americas, for Newmark Grubb Knight Frank offers an interesting look at the building boom that caused the recession of the early 1990s to show us that we are in relatively restrained times. Construction levels today are much lower than the industry’s prior two expansion cycles. 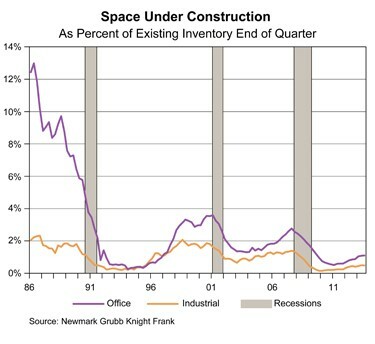 In the period leading up to the 2001 recession, office construction peaked at 3.6% of inventory while industrial peaked at 2.1%. The 1990-91 recession was preceded by a massive cycle of office overbuilding triggered by tax legislation in 1981 and 1986, which loosened and subsequently tightened the tax advantages available to real estate investors, setting off an ill-considered construction and lending boom that spawned the savings and loan crisis. It was the era of opulent, granite-clad towers delivered empty to the market. Texas fared worse than average due to reckless lending by many of its financial institutions compounded by an oil bust in the mid-1980s. Houston, with its lack of zoning, turned into the poster child for the boom-gone-bust and was punished accordingly by a generation of institutional investors who red-lined that market. Fast-forward to 2013 when Houston is near the top of investors’ buy lists. The overbuilding of the 1980s haunted the commercial real estate industry, tarnishing its reputation as an asset class suitable for conservative investors while leaving a residue of concern that the industry was chronically prone to similar episodes. But lenders and developers have been more restrained since then, which has played a large role in restoring the industry’s credibility among investors. Will that restraint hold? In New York, longtime observers are wondering whether demand will catch up with projects in the pipeline. In Washington, D.C., the market has softened as a moderate construction cycle ran headlong into tenant downsizing related to government cutbacks. But these examples are like ripples from a stiff breeze on a lake compared with the tsunami of overbuilding a quarter century ago. According to Bach 2014 will bring another surplus of demand over supply, reducing vacancy rates and pushing rents higher.